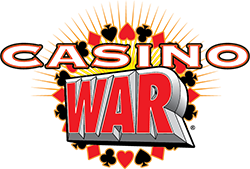 Casino WarSM Progressive is the fastest and simplest progressive table game to learn and play and is the only game where players can beat the dealer more than 50 percent of the time. To begin, players make a bet in the marked area, and the dealer deals everyone one card face up. If a player's card is higher than the dealer's, the player wins even money. If a player's card is lower, he or she loses (Ace is high). If a player's card matches the dealer's card in rank, he or she can either surrender half of the bet or continue to play by placing an additional wager, a "Tie" bet, and stay in the game at higher stakes. If the player chooses to make the additional "Tie" bet, the player and the dealer match the original bet and each receives another card. If the second card beats the dealer, the player wins all three bets. If the player loses, the player loses all three bets. If a player makes the "Tie" wager and ties the dealer, not only does the player win but he or she also wins an extra unit. Because of this rule, a player will win 50.3 percent of the time, assuming the player never surrenders. The progressive bet pays both fixed odds and a percentage of the jackpot. Players win if they tie the dealer. The top award—1,000 to 1 plus 100 percent of the progressive jackpot—occurs when a player and the dealer tie, the "Tie" wager is made, and they tie again with the exact same card (e.g. the 8 of hearts four times). Making the progressive bet also entitles a player to an Envy Bonus. If any player at the table wins the top award, all other players who made the progressive bet will win an Envy Bonus. To maximize game play, we recommend using a one2six™ multi-deck continuous shuffler. For more information on odds or the paytable, please contact your Bally Account Executive.